Whether your company operates locally, regionally or on a global scale, having the right lab space for chemical testing to help you monitor and control all of your processes is a key to your success. Regardless of whether you are in the petrochemical or refining industry, from raw materials processing to the final production line, having the right lab at the right time and in the right place can streamline workflows to make sure your products meet defined specifications, safety requirements and quality standards. 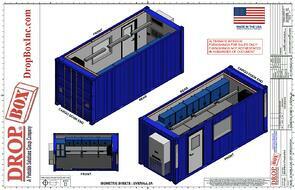 DropBox Inc. has been building portable chemical labs for customers at petrochemical plants and refineries for years. 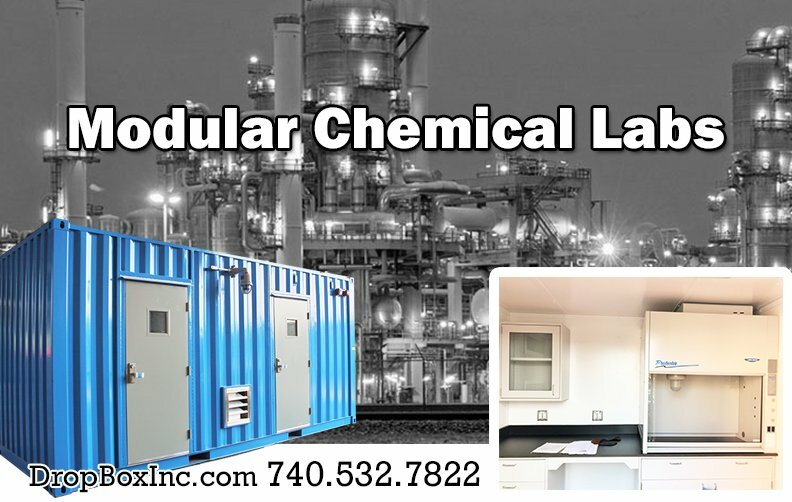 Based on our customers’ site-specific needs, we have engineered, designed, and manufactured modular chemical labs that meet the needs of customers throughout the U.S. and around the world. Whether you need a dry lab or wet lab, fume hoods, casework, or any combination of chemical accessories required to perform chemical analysis, DropBox Inc. can deliver the product that’s right for you. Modular Labs from DropBox Inc. are leading the industry in their use of shipping container modifications fully equipped with everything needed in a state-of-the-art lab. DropBox Inc. has created a portable chem lab, that allows lab technicians to have the ability to perform their work duties and quality protocols in a remote area. These portable chemical labs are site ready, for connection to power, water, and sewer, and almost instantaneously ready for operation. These modular solutions are perfect for both temporary and permanent use. 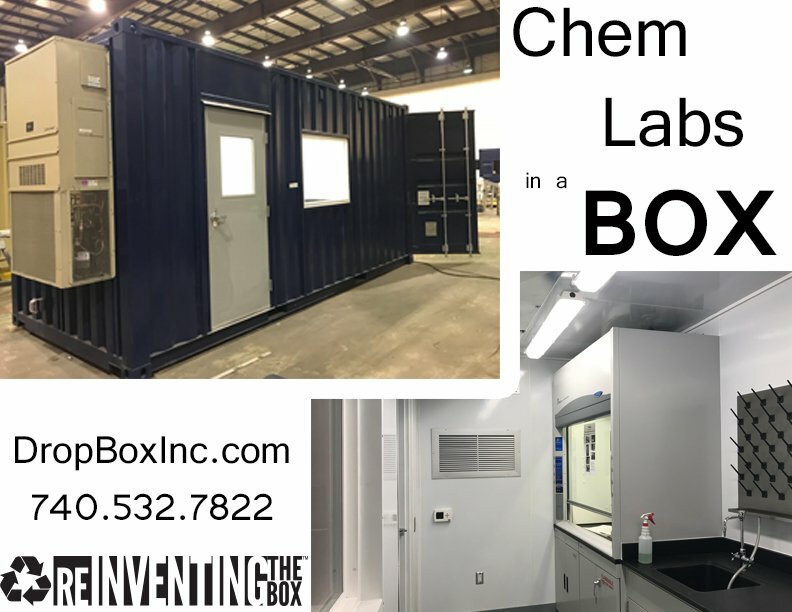 Shipping containers are the perfect solution for chemistry and research, they can easily be shipped, they come in multiple sizes, and are durable regardless of weather conditions. For more information on our Portable Chemical Labs, you can CONTACT US HERE or call 740.532.7822. Don't forget to check back, as our website is regularly updated with more shipping container modification info and products. When you think about a modular, portable chemical lab for chemical testing and experimentation you might think that due to the limited space associated with something small enough to be portable that you are going to get a more stripped down or rudimentary setup with only the most minimal of laboratory experimentation devices. If that's what you're thinking you're wrong. DropBox Inc. has been able to engineer and design portable chemical labs that offer a fully functional portable lab with all of the amenities you'd expect in any common laboratory around the world. 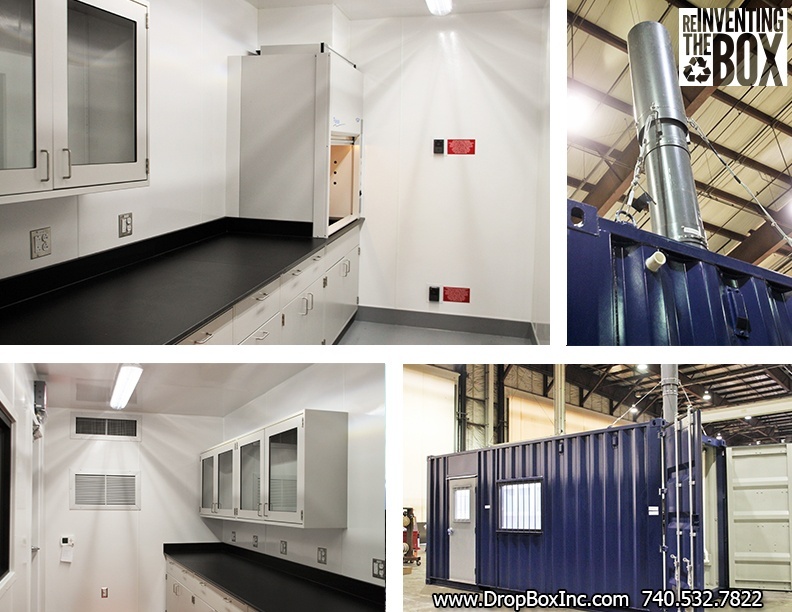 Complete with fume hoods, dry/wet analysis features, storage, and more DropBox Inc. delivers top notch portable chemical labs in a wide range of floor plans with any number of customizable amenities. Our modular chemical labs allow for onsite experimentation and testing without the need to build a lab and deal with the cost of construction. 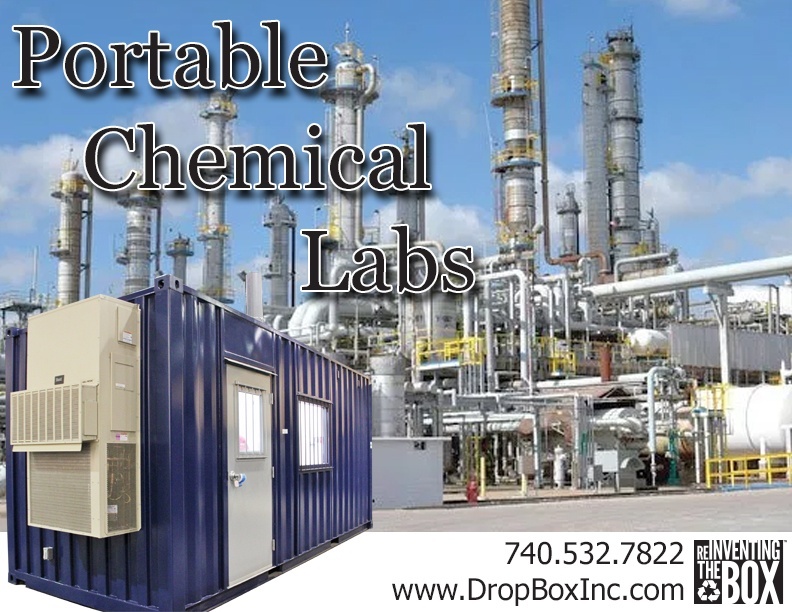 Utilized as either temporary or permanent chemical labs, DropBox Inc. labs provide the flexibilty and durability our customers have come to depend on time after time. 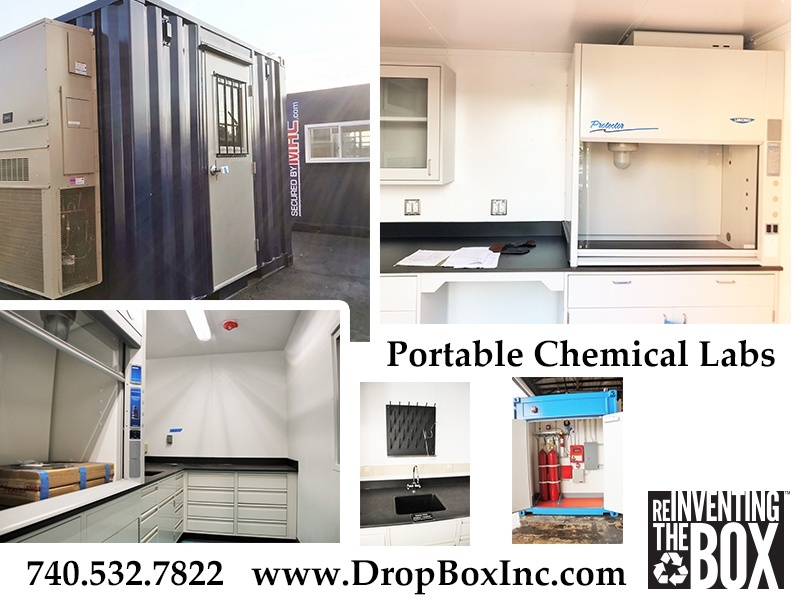 Over the years, DropBox Inc. has been building portable chemical labs for customers in the chemical industry based on our customers’ site-specific needs. While we have recently begun development of a standardized line of chemical labs that will meet the needs of customers throughout the chemical industry, we can also customize our design to meet your individual concerns. 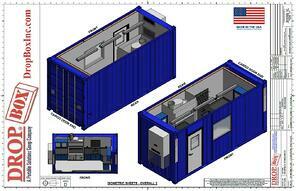 Floor Plan Options for Portable Chemical Labs by DropBox Inc.
DropBox Inc. has been building portable chemical labs for customers in the chemical industry for years. Based on our customers’ site-specific needs, we have recently begun development of a standardized line of chemical labs that will meet the needs of customers throughout the chemical industry. Whether you need a dry lab or wet lab, fume hoods, casework (cabinetry), or any combination of chemical accessories required to perform chemical analysis, DropBox Inc. can deliver the product that’s right for you. Below are some images of the standard models of Portable Chemical Labs we have engineered and designed for customers. 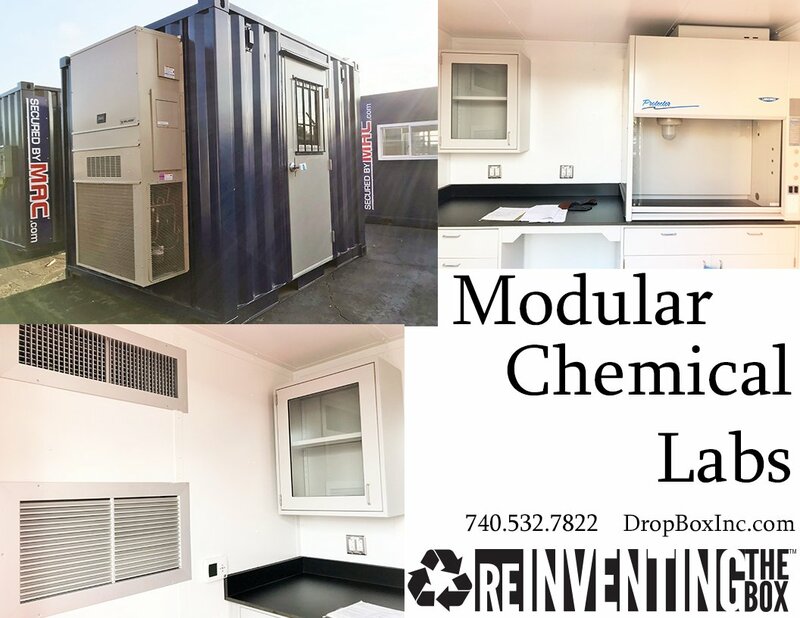 These ISO shipping container modifications have been modified with all the equipment and storage space needed to operate as a modular chemical testing laboratory for customers in the chemical industry. With every feature you'd typically find in any modern chemical lab our portable chem lab gives technicians the ability to perform their work duties and quality control protocols in a remote setting. 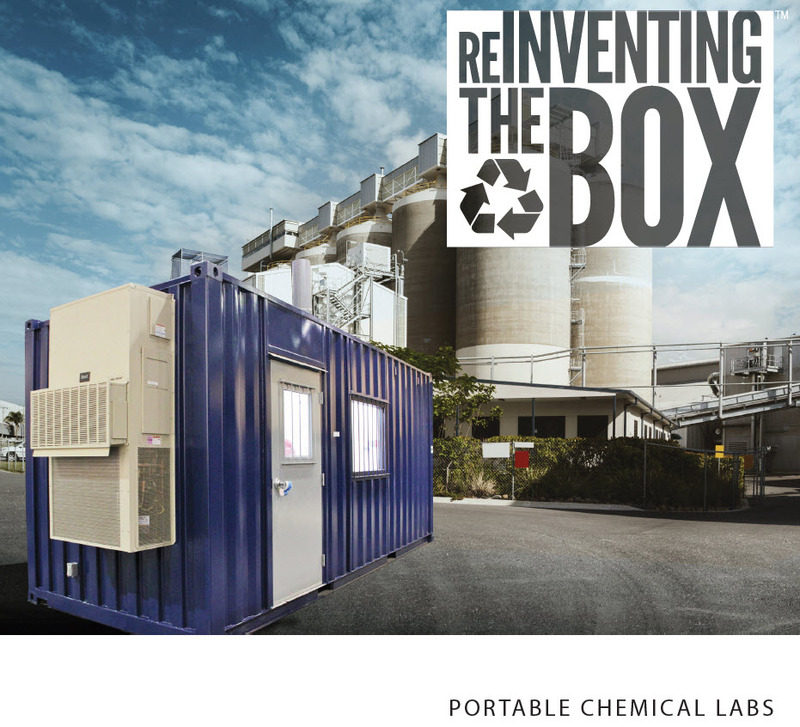 These portable chemical labs are site-ready for connection to power, water and sewer, and are immediately ready for operation. 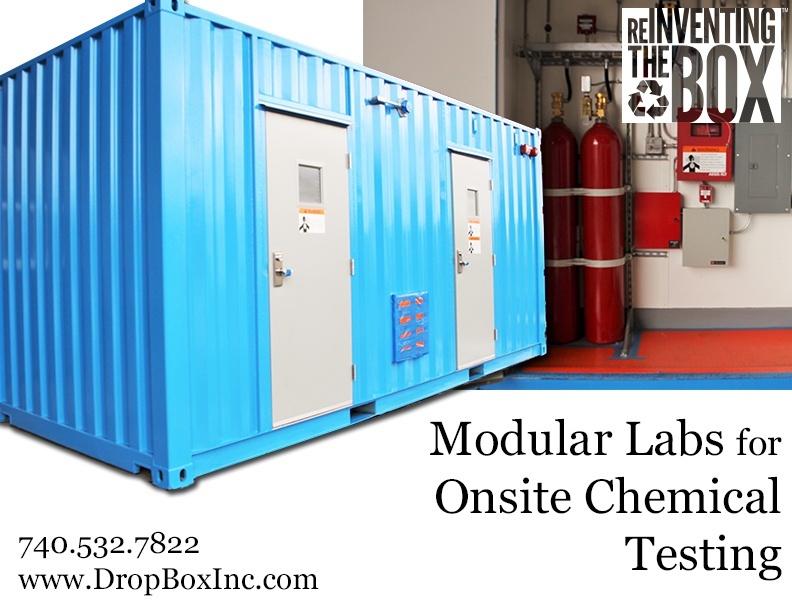 These mobile chemical labs are perfect for both temporary and permanent installations. Designed expressly for chemical laboratory use with industry standard interior finishes and mechanical systems, these modular laboratories are guaranteed to meet the demands of the chemical industry standards. DropBox Inc. has been building portable chemical labs for customers in the chemical industry for years. Based on our customers’ site-specific needs, we have recently begun development of a standardized line of chemical labs that will meet the needs of customers throughout the chemical industry. Whether you need a dry lab or wet lab, fume hoods, casework, or any combination of chemical accessories required to perform chemical analysis, DropBox Inc. can deliver the product that’s right for you. 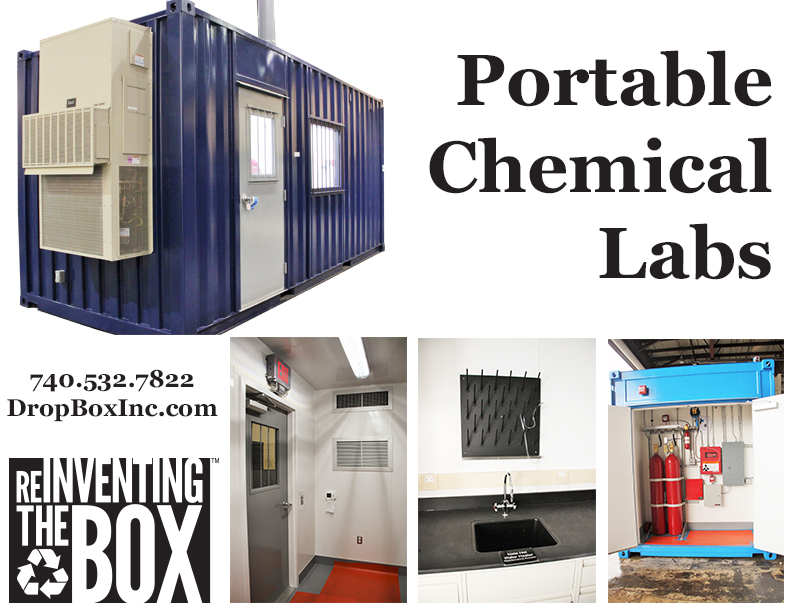 For more information on our Portable Chemical Labs, you can CONTACT US HERE or call 740.532.7822. Don't forget to check back as our website is regularly updated with more shipping container modification info and products. From the early 2000's through today, DropBox Inc. has kept customers’ site-specific concerns top of mind. We work with our clients to create custom ISO shipping container modifications designed and engineered to to meet their needs. From self-contained running water restrooms and portable offices, work stations, equipment, and tool storage solutions to complex battery and inverter housing modules, we have consistently worked to develop products that are not only suitable for any environment, but that are also portable and turn-key and can be put into use within minutes of arriving onsite. More recently DropBox Inc. has seen an increase in demand for custom portable laboratories for the natural gas industry. Between 2005 and 2014, US production of natural gas has increased by 70%, from 1.74 million barrels per day in 2005 to 2.96 million barrels per day in 2014 and the US has been the world's leading producer of natural gas liquids since 2010, when US natural gas production passed that of Saudi Arabia. The increased use of natural gas for fleet vehicles as well as electric power generation has lead to an increase in drilling operations that are often regulated with strict environmental guidelines. These guidelines often require the regular testing of ground water in and around the drill site as well as regular testing of the gases extruded from the drill site for refining. DropBox Inc. has worked with its customers in the industry to design, engineer, and manufacture portable labs that can be used in the often remote locations where drilling activities take place. Climate-controlled and complete with a wide range of lab accessories that can include storage space, cabinetry, counters, fume hoods, sinks, and proper ventilation. By building these units at our manufacturing facility in Worthington, Kentucky we can quickly and easily ship a turn-key lab solution to our customers. For more information on our Portable Labs and all of our shipping container modification expertise CONTACT US HERE or call us now at 740.532.7822.